The latest poll shows the Liberals losing official party status. Maybe decimating those liars, those that campaign on the left, but govern on the right, could be one of the best things that could happen to Canadian politics. Opinion: With a platform that's progressive and relatively fiscally restrained, the Ontario NDP is hoping to seize its window for success. Can it rise above the noise? Liberals would rather the PCs get elected than support the NDP. Do you think is the reason why Liberal party status may be in jeopardy? I think Liberals would rather the Liberals get elected than either the PCs or NDP. While Wynne briefly appeared rattled by the two-minute protest that ended when the four were peacefully escorted away by staff, she said she shared the demonstrators’ frustration at the impasse. Liberals elect Conservative governments, and Liberals elect Liberal governments. That is the way the system works. Fiera donated $2,500 to the Progressive Conservative Party of Ontario in 2007 and has donated $25,000 to the Liberal Party of Ontario since 2010, electoral finance disclosures show. In 2016, the company was included in a provincial trade mission to India. NDP to reduce Hydro bills by 30%. Sweet! At an event featuring community leaders, other legislators and musicians, the leader was nominated as a candidate in her riding of Hamilton Centre. Good policy, but with the following "but". Ontario voters should reflect on the successes Alberta premier Rachel Notley has had in Alberta. Oops! What else is Ford going to backtrack on? NDP platform also includes more affordable housing, a 15 per cent cut to auto insurance rates, better protection for tenants and money to fix crumbling schools. Noting like scandals to damage and/or destroy a government's re-election chances, eh! Here's a report on one of the two new First Nations ridings in Northern Ontario. Sioux Lookout resident Sol Mamakwa, a member of the Kingfisher Lake First Nation who works with the politically influential Nishnawbe Aski Nation, planned to announce his intention on Monday of vying to become the first New Democrat to represent the brand new riding. Liberals now need to decide whether or not they want Ford to be Premier. If they don't, there is only one clear path to stopping him. Where are all those strategic voters like Buzz Hargrove, etc. when you need them, eh! 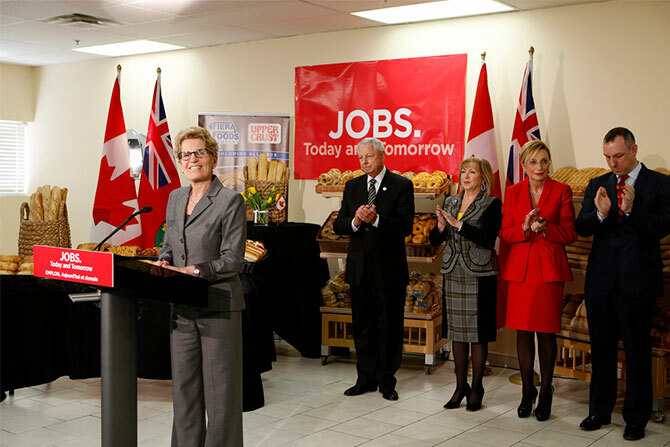 Wynne’s election chances seem to be following the same path as the province's finances. Which 2 parties are more alike again? The rich people are sitting on $1.8 trillion in cash. So they want high yield. Nothing better than Ontario bonds. Whoever wins the election, they will be told the Facts of Life by Bay St. You will keep borrowing whether you like it or not, because we need a higher interest rate than having it in the bank. And the more you borrow, the higher the rate. An easy $200-$400 billion more. Especially now Quebec stopped borrowing, you need to carry the load, Ontario! Debt peonage. Andrea Horwath kicks off her campaign at a health clinic, saying voters face stark choice between her and PC Leader Doug Ford. The Liberals are out of the running because Ontarians want change, she says. Doug Ford’s campaign staff ducked questions Tuesday about what he did to vet a London candidate who admits to a history of reckless behaviour that critics allege included slurs against homosexuals, Muslims, feminists and the disabled.